I am almost totally OUT of 2 1/2 inch scraps, thanks to this project. Happy Day! This project was looking very BLAH, but thanks to Marcie, who suggested I add some yellows and pale melon colors - it's sooooo much better, and it is coming to life. And of course, thanks to Bonnie at Quiltville.com for her pattern, although I'm not sure I added much zest to her original idea. If I sewed it a next time, I would decide on a palette, not just lights and darks, although by the time this is finished, I may change my tune. This is 50, 8 1/2 inch (raw) blocks, set on point (so I could brighten it with the side setting triangles). How many times have you started a quilt and discovered it lacked SOMETHING - and you put it away, unfinished? I must admit this has happened many times to me, only to surprise myself after adding a few bright blocks, or a bright border, or some red or yellow, that the blah quilt has now taken on a new life. DH reminds me of my much-used comment, "This is my new best favorite! ", after making changes along the way. Here are about 108 waste triangles that finish to 1 inch. I am on the third week of a cough, cold, flu - whatever. NOT swine flu, fortunately. Some things I still MUST do at work, and then come home and take naps, cough myself awake, take another nap, cough myself awake, etc. BTW, the over-the-counter product Musinex works pretty well, but is expensive. DH pushed me out of the bed because I was coughing too much -- had to go to the COLD downstairs bedroom, where I was thrilled to find the electric blanket still attached, and slept like a baby. I simply love scrappy quilts, and yours is a real beauty! WOW! 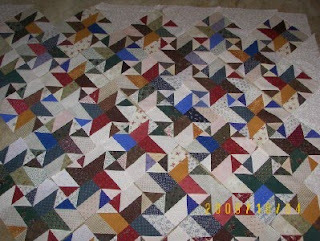 A scrappy Star Struck is on my list of quilts to make. I love this pattern. And it really generates lots of scrap triangles. In fact most of Bonnie's quilt patterns do give you lots of leftover pieces. I end up with containers brimming with these little gems. Somehow I cannot bring myself to throw them all into a bigger container. I have even taken to writing the date on them. I was using strawberry containers...now that they are out of season I will have to find another container at the grocery to recycle. Bonnie's containers are HUMONGOUS...have you noticed them in some of her past pictures? Someday I will have those size containers or the house will burst at the seams! Once again, Beautiful work and I like it set on point! Wow! I absolutely love it. What a co-ink-ee-dink, I have a print-out of this pattern pinned front & center on my bulletin board. Bonnie has so many great scrappy quilt ideas that I have a hard time picking one to work on. Hope the cough, flu-ish thing goes away soon. I've looked at this pattern so many times but not tried it. Yours is looking good from here! With scrappy quilts the more colours the better in my book. I've heard the advice add red and/or yellow to keep it zingy before - how true it is! Have you tried Vicks Vaporub on the bottom of your feet and then put on socks before going to bed. Supposedly this stops all coughing. Your quilt is very pretty. I love scrap quilts. I love this scrappy quilt top. It looks wonderful. I hope you start feeling better soon. LOVE THIS! Star struck is on my list of "to do!" I like that comment: I think this is my new best favorite. *smile* Here's to hoping you feel better soon. I love your scrappy quilt!!!! Bonnie has a fabulous website and blog and I just love going to it to get some inspiration! Your scrappy stars is lovely, and those little bits of yellow peeking out do give it sparkle. Re: lingering cough. Oh, yeah - I'm there. Can't shake the cough at night but my sweetie doesn't complain at all. Gotta love that. Oh this is great!! I am in the process of getting this same pattern done as well. You can go to my 4-19-09 post and see what I started. 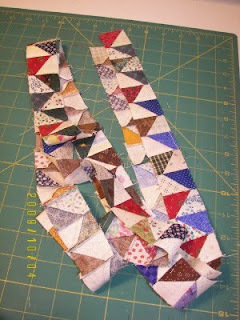 My post I have up now is the back to one of them...using some of those same little half triangle squares. I loved this pattern and yours is cheery and bright with the brighter colors you added. It's amazing yours looks so different from mine just by using different fabrics!!! Oh, i love this. Great how you make the colors harmonize. Take care and feel better soon!! Feel Better Soon! Love your quilt and the scrappy look is good for it. On this day of Oct. 05, 2009 I have made two Star Struck and one Star Gazing by quilt designer Bonnie Hunter. I still need to add borders to my pink/brown so that will be another post. First I have BD quilts to make. November is a busy month for BD quilts. p.s. I will tell Hubby about the Vicks Vaporub on his feet. No 2.5" scraps---want me to send you some? ROFLMAO!!! The quilt is wonderful, the additional colors were just what it needed. And electric blankets, I sleep under one ALL YEAR! I wake up much less sore and achey. You're almost out? Really?? Well good, now I can send you some of mine. LOL. I so love this pattern, and your scrappy happy version is great. Thank you for sharing your work, you are always an inspiration to me. Your quilt is gorgeous! I made a small wall quilt with Bonnie's pattern in a palette but I like this one SO much better! The colors make it sparkle! Yes, I always find orange and yellow and purple really give a scrappy quilt a lot of flavor! What a great scrap quilt. It is on my list of "To Do" quilts. Bonnie's designs are great. Hope you are feeling better. I am glad you have the bed with the electric blanket. Good advice from Marcie, this looks great! They're calling for some snow here this weekend but just a dusting...I have to say I'm kind of excited! I love it! I just love it.